Free multi-platform database tool for developers, SQL programmers, database administrators and analysts. 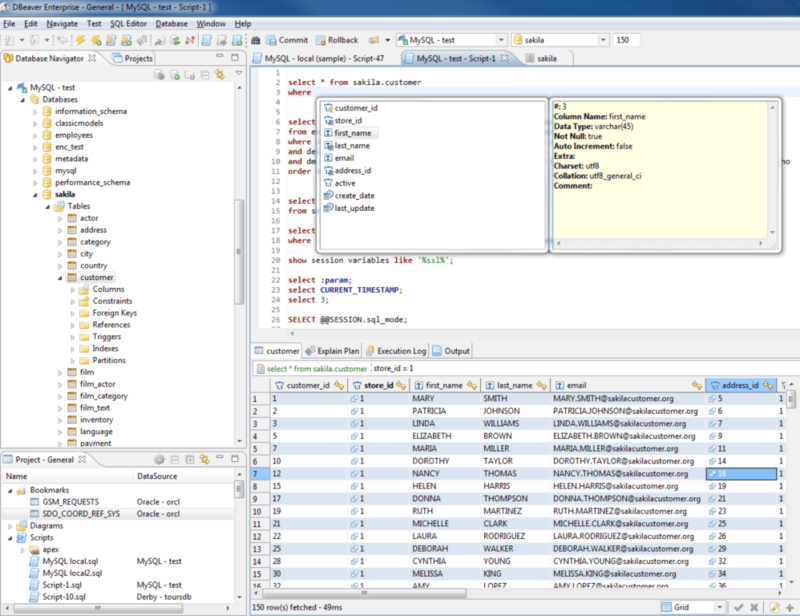 DBeaver is free and open source universal database tool for developers and database administrators. ## Features - Usability is the main goal of this project, program UI is carefully designed and implemented. There is a set of plugins for certain databases (MySQL, Oracle, DB2, SQL Server, PostgreSQL …) and different database management utilities (e.g. ERD). It has a great number of features. DBeaver consumes much less memory than other popular similar software (SQuirreL, DBVisualizer). Database metadata is loaded on demand and there is no long-running “metadata caching” procedure at connect time. ResultSet viewer (grid) is very fast and consumes very little ammount of memory. All remote database operations work in non-blocking mode so DBeaver does not hang if the database server does not respond or if there is a related network issue. ## Notes - Dbeaver is also avaialable as commercial Enterprise Edition.